Roasted Cauliflower and Potatoes with FetaEven with the name as a tipoff, you might not suspect at first glance that cauliflower is the flower portion of a plant. That plant, Brassica oleracea, is the same species as broccoli and other cabbage vegetables. If you grow your own cauliflower—or find one that's past its prime at the market—you might see little flowers sprouting from the white head, or curd. The coarse green leaves that surround the curd protect it from sunlight. By the way, those leaves are perfectly edible; try them in your next soup stock. The main producers of this cool-season crop are China, followed by India and the United States. In the U.S., California is by far the leading grower. The U.S. also imports cauliflower from Mexico and Canada. Cauliflower is an excellent source of vitamins C and K, folate and fiber. It's also a good source of B vitamins, omega-3 fatty acids, manganese, potassium, protein, phosphorus and magnesium. 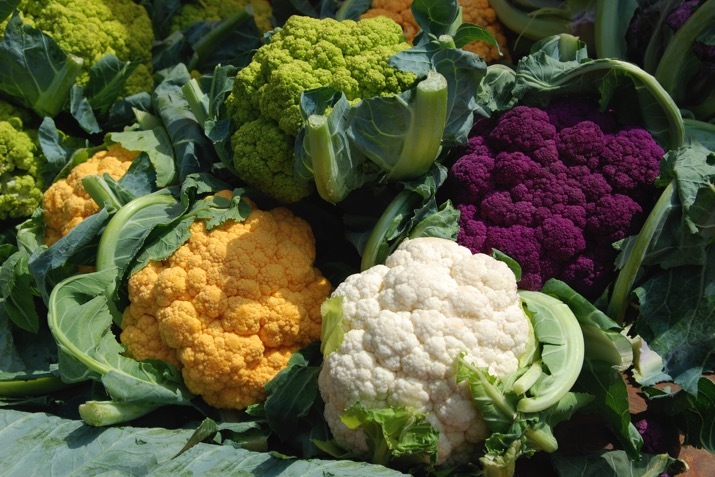 Colorful varieties boast even more nutrition than white cauliflower, with orange high in beta-carotene and vitamin C, and green topping the charts in vitamin C, minerals and protein, for example. White specimens often have telltale names like White Cloud, Snowball, Snow Crown and Snow White. Early Tuscan and Self Blanche are self-blanching varieties; this means they whiten without any help from the farmer, who normally protects the heads from the sun at crucial times until they whiten. Cheddar and Orange Bouquet are beautiful, deep orange varieties; Graffiti, Violetta Italia (an heirloom variety) and Purple Head are vibrant purples. Broccoflower and Broccoli Romanesco are green cauliflowers; they're actually cauli/broccoli hybrids. A regular on the veggie platter, raw cauliflower is crunchy-crisp and fresh tasting, almost nutty and sweet. Cauliflower is delicious cooked too, of course. Try it steamed, sautéed or oven-roasted, with olive oil, a bit of garlic, sea salt and fresh herbs. Add it to a curry or stir-fry. Or use it as the basis of a soup or casserole, perhaps topped with cheese. It can even be cooked and mashed like potatoes. Roasted cauliflower—alone or with other vegetables—is delicious atop pasta, pizza or a salad. You might even try it in a sandwich. Here's a great recipe for Smoky Roasted Cauliflower. Cauliflower is popular in Indian cooking, perhaps because it's such a good foil for myriad spices. This recipe for Biryani Rice with Cauliflower and Peas, redolent with ginger, cumin, turmeric and cayenne, is a delectable case in point. Other spices that go especially well with cauliflower include garlic, red pepper, black pepper, white pepper and nutmeg. Keep in mind that you can substitute cauliflower in recipes calling for other fall or root vegetables, like these Roasted Carrots, Potatoes and Shallots, for example. Cauliflower is available year round in some markets, though it's most plentiful in the spring and fall. While the size of the head isn't related to quality, heft is; choose compact heads that are heavy for their size. The best cauliflower heads are clean, white and free of spots and small flowers. Heads with thick green leaves around them are fresher and better protected than those without. Store the cauliflower in a paper or plastic bag in the refrigerator, stem side down, for up to a week. Store pre-cut florets for a couple of days.